Harper Price, peerless Southern belle, was born ready for a Homecoming tiara. But after a strange run-in at the dance imbues her with incredible abilities, Harper's destiny takes a turn for the seriously weird. She becomes a Paladin, one of an ancient line of guardians with agility, super strength and lethal fighting instincts. This sounds like just the book I'll be looking forward to during my Birthday-month. It's got the pretty, girly looking cover and a killer storyline that's Fantasy-filled. Plus, it's got that Southern-charm that I adore completely. I'll definitely be waiting on this one! Can't wait to get my hands on it. Are you waiting on Rebel Belle, like me? I am waiting for Rebel Belle Too! I love the cover and title and I can't wait to see what the book has to offer. I hope you enjoy it :) Thanks for sharing! Yes this is one I want to read too!! I love that cover! I am so excited for this book to finally be released! 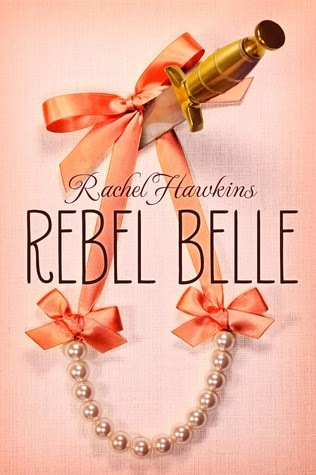 I love Rachel Hawkins, and I can't wait to check out this book! :) Cute blog! Ahh, so want to get my hands on this. Haven't read the Hex Hall series yet, but heard a lot of good things about them, so this should be good. :) Thanks for stopping by mine earlier! I'm definitely excited for this one. It looks awesome and that cover is perfect. Great pick!